All natural and filled with LOVE! 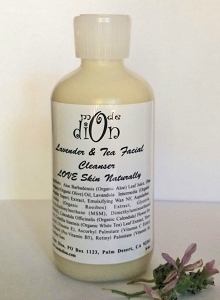 This cleanser is soothing with a delightful aroma of fresh pure lavender. Only the finest natural Removes makeup and impurities gently . Lavender- The aroma will reduces anxiety, stress, headaches and helps sleep. Lavender balances skin, treats acne, heals and de-ages with powerful anti-oxidants. Tea's- Roobios removes dead skin and White tea improves firmness. Aloe- helps remove makeup easily, heal and sooth skin. Aloe Barbadensis (Organic Aloe) Leaf Juice, Olea Europaea (Organic Olive) Oil, Lavandula x Intermedia (Organic Lavender 'Super') Extract, Emulsifying Wax NF, Aspalathus Linearis (Organic Rooibos) Extract, Glycerin, Methylsulfonylmethane (MSM), Dimethylaminoethanol (DMAE), Calendula Officinalis (Organic Calendula) Flower Extract, Camellia Sinensis (Organic White Tea) Leaf Extract, Tocopherol (Vitamin E), Ascorbyl Palmitate (Vitamin C Ester), Panthenol (Pro-Vitamin B5), Retinyl Palmitate (Vitamin A), Xanthan Gum.